James Cameron and Bill Paxton, director and actor of the 1997 film Titanic, travel to the final undersea resting place of the ill-fated ship of dreams. The legend no one can forget has become the greatest 3D adventure ever filmed. Now He's Really "King of the (Water) World!" Director James Cameron scored, against all odds (and his swarm of nervous auditors) a huge success with "Titanic." Not as artistically strong as several predecessor films about the legendary disaster it rocked the box office boat as new generations of Titanic enthusiasts and curious folk flooded the theaters. 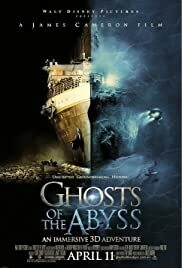 Personally fascinated by the tale of the doomed April 1912 maiden voyage of the era's seaborne tribute to Mammon, with its unsolved mysteries - technical and human - Cameron dives to the wreck site in this 3-D stunning documentary, "Ghosts of the Abyss." RMS Titanic's grave was discovered by Robert Ballard, the foremost maritime archeologist working today. Using the then latest technology he first located the wreck and then filmed it with "Alvin," a submersible of amazing capability. But today ""Alvin" is to underwater exploration and technology what a typewriter is to a PC. Basing his expedition on a Russian research vessel, Cameron takes to the depths and launches "Jake" and "Elwood," two camera-equipped robots that can be guided from the mother ship's two submersibles through the interstices of the sprawling Titanic. These robots can and are guided through spaces no person could maneuver in, even at shallow depths. Cameron's intense nature masked by good humor comes clearly across as actor Bill Paxton narrates much of the film. 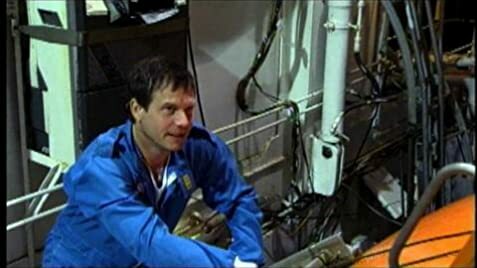 Paxton doesn't seem to be acting as he seeks multiple reassurances from the Russian crew man operating the descending sub that there are ways to escape if something goes wrong. "Jake" and "Elwood" capture scenes from the ship no previous expedition could. At one point the viewer is staring up front at a bathroom mirror with water jug and glass eerily standing exactly where the stateroom's occupant left it before the collision. The grand staircase is gone but its cavernous space is superimposed by scenes from Cameron's feature film, creating an almost scary sense of reality. Period music accompanies the changing scenes which alternate the brief life and long interment of the grand vessel. This was a scientific expedition with microbiologists on board to assess the continuing and inevitable reduction of RMS Titanic to dust. But the bulk of the film deals with the evidence of life on the ship during its short journey and the story is told with verve. This is a 3-D film that fully and beautifully exploits the medium and it's a deep sea outing for the whole family. All that said, is there anything negative about "Ghosts from the Abyss?" There sure is: whatever the cost of 3-D cinematography it's a near crime to limit the end result to a mere 60 minutes! !